There isn't much that I like more than visiting lighthouses during the summer. The sun, the sand, and sunny skies lend themselves to long lazy days walking along the beach, sun bathing, boating, and building sand castles. We're lucky here in Michigan, where more than 110 lighthouses dot the coasts of the Great Lakes that surround our state's Lower and Upper Peninsulas, and I'm especially fortunate to have visited many of these historic beauties over the years. 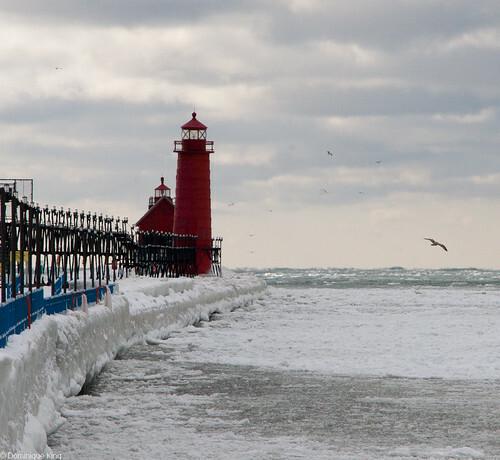 Tourists flock to our lighthouses during the summer, but bone-chilling cold, high winds, drifting snow, and icy piers keep many visitors at bay during the winter months. Winter does bring an especially stark and crystalline beauty to the snow-kissed and isolated beaches, though. 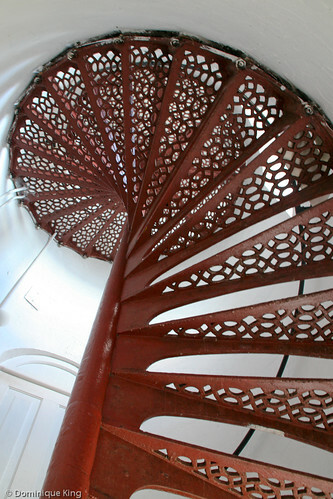 No, there isn't much I enjoy more than a summer visit to a lighthouse...except visiting a lighthouse during the winter. The winter scene can vary greatly, depending on whether you're experiencing steel-grey wintery skies or the brilliant blue of a sunny sky contrasting with clean white snow and the crisp white or red of many of the lighthouses. No matter what the mood of the day seems to be, experiencing the quiet isolation and beauty of a deserted lighthouse and beach on a winter day gives you a real sense of the isolation and lonely lives of the light keepers living at these towers many years ago. Here are a few images of Michigan lighthouses I've taken through the years of towers along the state's western coast along Lake Michigan. The brilliant red of the range lights at Grand Haven makes this site a particularly picturesque photo subject. It's easy to see why these lights and the pier remain a year round favorite place for many visitors. 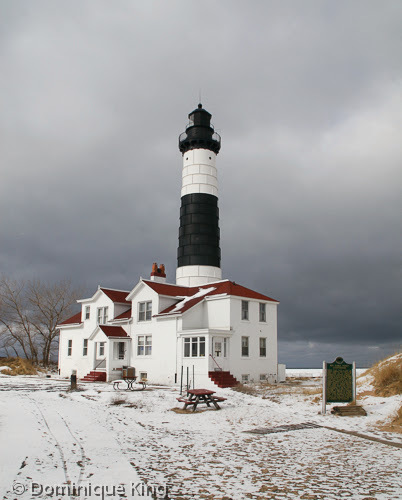 We visited the Little Sable Point Lighthouse just as a light show began falling late one dreary winter afternoon. It's easy to feel the isolation at this lonely spot, where little else besides a scrubby little tree keeps the Little Sable Light company on this day. 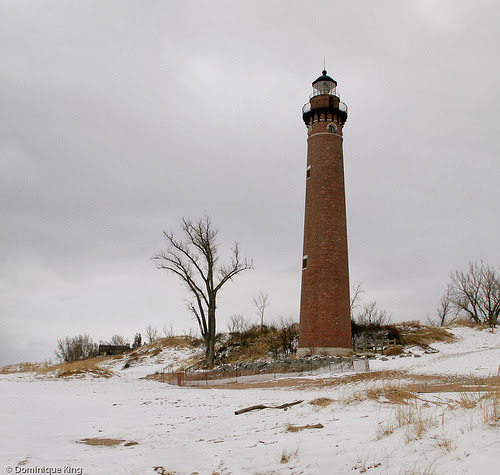 I imagine that the lighthouse at Big Sable Point is beautiful on a sunny summer day, but I rather like the stark image of this light against a threatening winter sky. The 1-1/2 mile walk out to this lighthouse takes a nice level trail from a campground at Michigan's Ludington State Park out to Lake Michigan, although it was as cold as it looks in this photo as the snow began to roll in the day we visited. 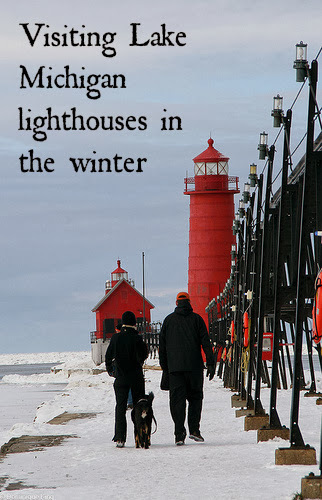 The walk out to the Manistee lighthouse at the end of a pier is a very pleasant experience during the summer, when scores of boaters and fishers flock to the site and the white lighthouse presents a nice contrast to blue skies and lake water. It was a little tough to get a decent photo of the white lighthouse against a grey sky and the icy lake the day I took this image, but it does make it easier to envision the lonely days experienced by light keepers during the 19th century. The lighthouse at Point Betsie near Frankfort is a real favorite of mine, and we've visited it many times over the years. I particularly like this image of the light with its red roof presenting a beautiful contrast with the blue sky and the snow-kissed beach. 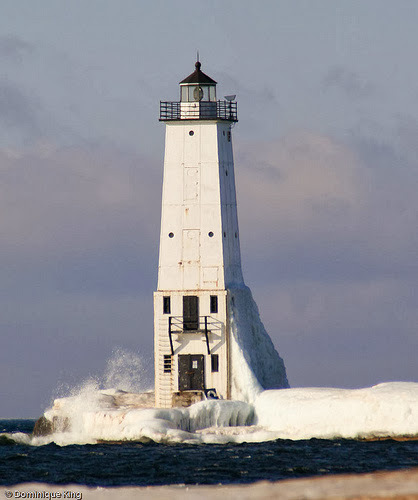 I always love images of lighthouses that show the buildup of ice and snow against the towers demonstrating the towers' sturdiness in facing the onslaught of the elements. 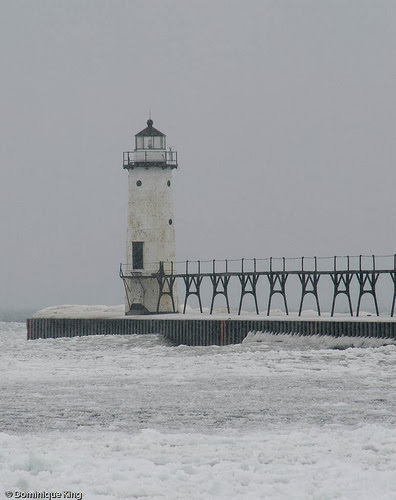 This image showing the icy water in action as it works to encase the lighthouse at the end of the pier in downtown Frankfort is one of my favorites from this particular visit. 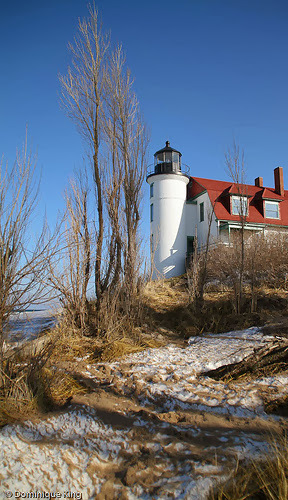 Visiting the Grand Traverse Lighthouse entails taking a scenic drive out to the tip of the Leelanau Peninsula, which is the tip of Michigan's "little finger" if you're a Michigander demonstrating its location on Michigan's mitten by using your hand. 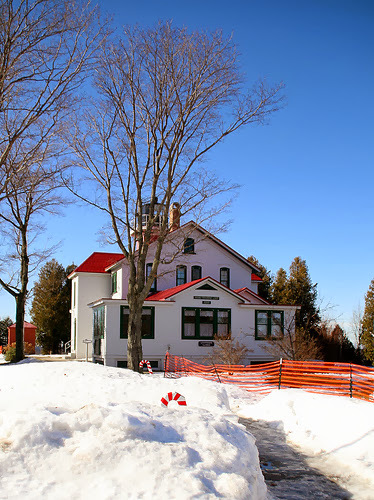 We visited this lighthouse one February when you can still see the candy cane holiday decorations along its walkway and temporary orange snow fence. Dominique King is a metro Detroit writer who began her writing career as a freelance business writer for local newspapers and magazines. Dominique is the publisher of MidwestGuest.com, a member regular blogging team at DiscoveringOhio.com and authored a series of encyclopedia entries for the Michigan Companion. She has a degree in Communications (M.A.) from Detroit's Wayne State University.